The past few years, 2015 and 2016, I’ve run this race the weather conditions were perfect. This year they weren’t. Far from it. This came off the back of another work trip to Europe, ending with a flight arrving late Thursday night at JFK from London Heathrow. I’d had an easy few days so felt rested and the body clock, on Europe time 5 hours ahead, meant I was wide awake, if not raring to go, at 5am. But I went into this race with confidence riding low. I’d been well beaten in the New Balance 5th Avenue Mile, was carying a low level calf strain that had caused me to cut short a Mona Fartlek session on Tuesday, and considerable work travel that had gotten in the way of my usual run routine. The last 8 days I’d been on a whistle stop Europe tour taking in London (twice), Munich (for Oktoberfest at this great joint), Brussels and Frankfurt. I got in some great runs including two from a Munich Airport hotel, this one where a flat iPhone battery caused me to run 5 miles overdistance. In just over 24 hours I drank 2 litres of beer, ate half a duck and ran 26 miles. I’m strangely proud of that ‘achievement’. That 26 miles got me to 70 miles for the week, the weekly target that’s eluded me for much of the past 4 months. Right, back to the race. Sham and I picked up team mate Javier Rodriguez from Dobbs Ferry as we drove to the race from Peekskill. Javier and I jumped out of the car at the junction of the Madison Avenue Bridge and I87 and ran the mile or so north up the Grand Concourse. We ran the first and last mile of the course, did a few strides, met up with Urban Athletics (UA) team mates and got into the starting corral. Then we were off. Along with 15,000 others. I quickly settled into a group including Bobby Asher (VCTC) and Brian Leese (NBR). We passed the first mile in 5:15. My target was sub-55 minutes. That would demand an average pace of 5:30. But I’d not fully factored in the weather. It was in the high 70sF (25C), bathed in bright unforgiving sunshine on an exposed course. I traded places with the group but some got away. By mile 3 I had settled into 5:25-5:30 pace. My group kept changing composition. Brent Frissora (NYAC), who I’d narrowly beaten when running 53:36 in 2015, cruised past. I tried to join his train. I did for all of a mile. I passed mile 3 in 16:20 and 5K in 16:55. At this point of the race I thought I might not be able to finish. I’d maybe gone out too hard. A big group was chasing me. And the short climb out of the underpass around mile 3 felt like a mountain. The end of the Grand Concourse came into view. I was now stranded and would be until I got back onto the Grand Concourse just shy of mile 6. I passed half way in 27:35. The long steady incline up the Mosholu Parkway from the Bronx Botanical Gardens to the Grand Concourse slowed me to a 5:47 6th mile. But any thought of stopping I’d flushed from my mind. Everyone was hurting. And I was needed for the team – open, masters and M50+. As team mate Paul Wong, a fellow Brit, had said the M50+ NYRR 2017 Club Standings were “as tight as an Arsenal shirt”: UA and CPTC were neck ‘n’ neck on 108 points, 84 less the worst two races. Onto the Grand Concourse I was joined by a group of 5 including team mate Javier and top M40 contenders Guillermo Pineda Morales (Memo) and Klaus Kuorikoski (a new comer to the NYRR racing scene from Finland and racing for Henwood’s Hounds). I passed 10K in around 34:15. A few of the group, including Memo and Klaus, opened a gap on me. I was now in damage limitation mode, just like in the closing miles of a marathon. Javi dropped off the back. I now had my sights on Klaus, who Memo had gapped, and Brent who was slowing down after opening a big gap on me mid-race. I knew that I was home and dry at around 8.5 miles as I passed Brent. From there it’s an ever increasingly steep descent to the finish line outside Yankee Stadium. I got into my stride in those final few miles. I was now catching the runners in front. I overtook Klaus but on official timing (cip to chip) we were level on 55:24. Good for 24th overall, 1st M50+ and 2nd M40+ (after Memo on 55:06). I topped the age grading with 89.65%. Sebastien was next UA man home, running 56:14 for 3rd M40-44, followed by Javier on 56.43 for 4th M40-44. That nailed the M40+ team for UA by over 9 minutes. It was a good day for the Team UA. The W40+ (Fiona Bayly (1st W40+ in 61:46), Ellen Basille (2nd W45-49 in 65:40) and Cathrine Wolden (4th W45-49 in 66:49) won by almost 15 minutes, nearly 5 minutes for each of the three scorers. That leaves the M40+ and W40+ teams with almost unassailable leads in the NYRR 2017 Club Standings. The M50+ team (Adam Kuklinski (7th M50-54 in 63:38), Paul Wong (20th M50-54 in 68:25) and me) also placed first, and now have a narrow gap over CPTC in the 2017 club standings. Things were less rosy for the UA open teams (6th men and 8th women), depleted by injury athletes and those focused on a fall marathon. The NYRR race report is here. Harbert Okuti of the Westchester Track Club broke the finish tape in 49:32, while Roberta Groner of the NYAC won the women’s race in 56:50. So it played out better than hoped. I had self doubts during the race. But those doubts were overcome by the need to do my best for the team. And I came away top of the UK M50 rankings for 10 miles. While I like to think I’m better than a ‘one trick pony‘, today I was rudely reminded that it’s a case of ‘horses for courses‘ and the mile is not my course. I simply got soundly beaten, by several lengths, by a mile specialist. In fact by the time we reached two furlongs to go, the final quarter, it was all over bar the heavy breathing. Right less of the horse racing analogy, more of my day out at the New Balance 5th Avenue Mile races. Going into this one the writing was on the wall. It’s just that I failed to read it. Since March I’ve been having various issues with my right leg. In 2017 it seems I’ve had just about everything – ITB, then hamstring / glute and most recently shin splints – and yet for the big occasions I’ve been injury free, though sometimes underprepared. Recently my problems have ebbed away but my race sharpness has been eroded through lack of high intensity training and long runs. And so it all came to roost today. When I first ‘settled’ in New York and ran for Warren Street I used to avoid the 5th Avenue Mile. The distance did not appeal and I was not training for it, preferring instead to focus on preparing and racing 10Ks and half marathons. Then it became a club points race and ever since I’ve tried to compete whenever I can. But I’ve not adjusted my training. I last ran it in 2015. I clocked 4:45. I was hopeful of something similar. After warming up with team mate Ramin Tabib I lined up with fellow male and female runners 50-59. There was some 500 of us. There was great camaraderie. Many if not most of us were sharing injury stories. It comes with the age. And trepidation about running our slowest ever mile. After all we ain’t getting any younger. And I got acquainted with some new competitors, not least Gerald O’hara who was edged into 2nd in 2016. Gerry had a 4:41 indoor time to his name earlier in ’16. He was the man to beat. My goal was 4:50 but, more importantly, to compete. Being on the front row I got a clean start. 5th Avenue is a fast road mile – dead straight, wide roadway, good road surface and gently undulating with a slight descent in the first quarter, slight incline in the second, and again slight descent for the second half. I ran alongside Gerry through halfway passing the first quarter mark in around 1:10 and the second in around 2:25. I felt pretty good at this point. But then Gerry found an extra gear and went away. And kept pulling away. And all I could do was spectate. His lead had extended to some 30 metres by the three quarter mark which I reached in around 3:40. I was now hanging on for second but the shouts for “Brad” were getting closer and louder. And so it was no surprise he tore past with a furlong to go. I sensed others were chasing me down but fortunately the finish line came soon enough. I breasted the line in 3rd place in 4:53 (AG of 87.59%, the lowest of 2017), 9 seconds shy of Gerry and 3 behind Brad. Gerry was an emphatic winner. One year I have to train specifically for this and see what I can do. The time was good enough to top the UK M50 rankings but is way off what the top Americans are running. In addition to Gerry, Todd Straka, USATF 2017 M50 mile champion who’d made the trip from Boulder, ran 4:29 in the open race. I reflected that while running a half marathon I’m in some sort of zone, a comfort zone of sorts, for much of the race. Only in the closing miles do I start to grind. But in the mile I spend none of the time in that zone. I’m grafting from the gun. The team excelled. Urban Athletics won the M40+ (Javier Rodriguez (3rd M40 in 4:29), Matt Chaston (2nd M45 in 4:33) and Stefano Piana-Agostinetti (4th M45 in 4:40)) W40+ (Fiona Bayly (1st W50 in 5:17), Jennifer Harvey (1st W45 in 5:22) and Cathrine Wolden (2nd W45 in 5:23) and W50+ (with two newly minted W50s Fiona and Dominique Saint-Louis (3rd W50 in 5:25) joining Ivy Bell (2nd W60 in 6:39)). In both open races UA finished 6th. In the overall, year to date club standings, UA lie first in M40+ and W40+ and equal first with CPTC for M50+ while in 4th and 5th respectively for open men and women. Our M50 team (Jonathan Schindel (5th in 4:55), Paul Wong (14th in 5:09) and I) came second to a CPTC team led home by Gerry and Brad. UA’s W40+ were the standouts, winning comfortably. Again. And the W50+ most improved. Some UA runners logged impressive PRs including Ramin Tabib, Bob Smullen, Ivy Bell, Dominique Saint-Louis and Elizabeth Dellamora. The many races making up the 2017 New Balance 5th Avenue Mile featured more than 7,500 runners, the largest field in the event’s 37-year history. The race’s professional athletes provided historic performances to match, with Jenny Simpson making it her sixth win and Nick Willis his fourth. Now the mile is not my cup of tea. But the 5th Avenue Mile is. The venue is breathtaking: when else can you run 20 blocks down the middle of 5th Avenue ending at The Plaza? The occasion is spectacular: elite runners from around the world, the television cameras, runners of all ages. But most importantly the New York City running community is in the limelight. And today some, like Mark Williams and Reno Stirrat, went from being virtual friends on Facebook to the real thing! So much better. I went into this event with trepidation – about whether I could get there and once there whether I could race well. Getting there proved easy as my best laid plans came to fruition. Getting a good confidence boosting race under my belt proved a tougher nut to crack. The silver lining lay in the way the race motivated me to ramp up my game leading into the half marathon at the European Masters Athletics Championships in Denmark. In recent weeks I’d been travelling extensively throughout Europe for work. My employer is a tiny Brussels’ based association. No Brexit for me. I typically spend 2-3 weeks a time, 5-6 times a year, based in the UK with friends and family and sandwich together meetings and events to maximize the bang for the buck. This time, as my running log shows, for some 14 days I was working and running in Brussels, Vienna, London (ironically in Wimbledon running around the Common), Kettering, Warsaw and finally Berlin. Try as I might to maintain my running routine – including a 11 miles along the river in Vienna at 10 pm soon after touch down – eventually long runs and workouts gave way to steady runs and then no runs for two days in Berlin. For good measure I brought a cold back with me along with dirty laundry. The one positive was that Russ Stram seems to have sorted my hamstring tendinitis. Getting to the race start line was always going to pose a challenge. I’d decided to use public transit. I boarded the train at Peekskill at 5:10 am, arriving at Harlem 125th Street at 6:10 am where I met Urban Athletics (UA) team mate Ramin Tabib. We boarded the M60 SBS to La Guardia, getting off at the furthest most stop at Terminal D. At this point Ramin had a rather skeptical but my iPhone helped us navigate the two miles – a useful warm-up – to the venue. At the venue it was as if the entire NYRR running community, with all its clobber and paid parking of $25 to boot, had been accidentally teleported into Queens. Many Manhattan residents (sorry folks but I couldn’t resist this) seemed to be lost overboard, some 6 miles from the familiarity of Central Park. Queens is typically viewed from the ‘safety’ of their taxi or Uber en route to LGA or JFK. At the venue – the 900 acre Flushing Meadows Corona Park – I seemed to have gained new found notoriety thanks to Will Sanchez. Will, a real connoisseur of the New York running scene, had invited me on his show ‘Gotta Run with Will’. The show was cut in early April just ahead of my running the London Marathon and went on general release in mid-May. I usually cringe at videos of my talking on camera but Will did a great job of making me look quite interesting. The phone hasn’t started ringing yet from Hollywood. I’m all set to guest star in a real life drama ‘Escape from Queens’. Back to the race. My target was to run even 5:20 pace which would give me around 33 minutes. The course was about as flat as they come but included a number of sharp turns. The temperature was a perfect high 60s but the humidity was tropical. The first mile proved tricky to navigate as it was narrow and winding. I settled into a large pack which included team mates Jason Lakritz, Javier Rodriguez, Jamie Brisbois, Sebastien Baret (first race as M40+) and Aaron Mendelsohn. We had many for company including top masters John Henwood and Memo Morales Peres who I’d duked it with in Brooklyn. I did my fair share of the pacing. We navigated past the bunch of elite women who’d started out fast. The group was so large and tightly packed we kept clipping elbows and feet but fortunately no one tripped. We passed the mile mark in 5:20, some 20 seconds off the lead group. Midway through the second mile the roadway was water logged and left us all covered in muddy spray. We passed the two mile mark in 10:40. The group was working together, as though there were an unspoken truce. In the third mile Jason threw the hammer down and the truce was over. The group went from close knit bunch to a long thin line, me nearer the back of the line. Sebastien and John had dropped away. Javier and Memo were up ahead, leaving me 3rd masters. I quickly came to realize this was going to be a hard day at the office, one for the team. I passed mile three in 16:10 and the half way in 16:41, 20 seconds slower than my last 10K. In the latter half I concentrated out damage limitation – time and place. I figured I could just about hold this pace and clock around 33:15. As we headed out to Citi Field (the last time I ran here in the NY Mets Run to Home Plate 5K in 2005 – won by John Henwood – it was Shea Stadium and Citi were a profitable bank) past the National Tennis Center the road was flat, fast and largely straight. Pity my legs and lungs failed to capitalize. I got to four miles in 21:30, the fourth mile of 5:25 being my slowest so far. But not the slowest. I held my pace for the fifth mile, passing five miles in around 27:00, and then started to unravel as I circled the Unisphere in the final mile. I covered the sixth mile in 5:30. Rarely do I close out a race with my slowest mile, except the marathon. My 33:36 finish time was good for 1st M50, 3rd masters (after Memo in 33:12 and Javier in 33:21) and 24th overall. My age grade was 90.2%, 2% lower than my average for 2017 races, and second overall. I forgot to stop my Garmin. Some day I’ll remember. The heart rate readings were way off, likely due to my wrist band not being tight enough. I milled around the finish funnel talking to rivals and team mates. Many of UA team had run slow times. We scratched around for an excuse and unanimously decided on the humidity. But then Ellen Basile breezed up to announce she’d smashed her 10K PR by over a minute. We were all very happy for Ellen but sad our excuse had been trashed. As NYRR reported this year’s race had more than 10,800 finishers, the most ever. Ayele Megersa Feisa of the West Side Runners broke the finish tape in 30:25 in a close finish over teammate Mengistu Tabor Nebsi. Belaynesh Fikadu, also of WSX, was the winner on the women’s side in 34:13, six seconds ahead of Roberta Groner of the New York Athletic Club. UA turned in stella team performance. The men were 2nd in the open division (at the time of writing they were showing 4th since the NYRR results service was only scoring 3 runners rather than the 5 of Jason, Javier, me, Sebastien and Jamie), the women 4th (Harriott Kelly, Fiona Bayly and Ellen). Our W40+ team knocked the competition out of Citi Field: Fiona, Ellen and Cathrine Wolden won with over 16 minutes to spare. Javier, me and Sebastien won the M40+, albeit in less emphatic style. To complete the set (!) UA (me, Jonathan Schindel and Adam Kuklinski) won the M50+. 43 UA runners towed the line, a large proportion of the total active membership. Many placed in the top 10 for their age group and there was some great packing: Jason (16th overall and 7th M25-29 in 33:07); Javier (21st overall and 2nd M40-44 in 33:21); me (24th overall, 3rd M40+ and 1st M50-54 in 33:36); Sebastien (27th overall and 3rd M40-44 in 33:57); James (32nd overall in 34:02); Aaron (6th M40-44 in 35:10); Harriott Kelly (7th overall and 2nd W25-29 in 36:23); Stefano Piana-Agostinetti (7th M45-49 in 37:30); Adam (4th M50-54 in 37:47); Jonathan (5th M50-54 in 37:53); Peter Heimgartner (10th M45-49 in 38:07); Fiona (1st W40+ and 1st W45-49 in 38:18); Ellen (2nd W40+ and 2nd 245-49 in 38:52); Stephane Bois (8th M50-54 in 39:23); Paul Wong (9th M50-54 in 39:45); Cathrine (5th W45-49 in 41:23); Jennifer Harvey (6th W45-49 in 41:37); and Jennifer Amato (5th W40-44 in 42:42). So it was game, set and match to UA. Ramin was a wee bit disappointed, running oustide 42 minutes. As we left the venue to retrace our steps back to Manhattan via the M60 SBS most Manhattan runners were seen ‘legging it’ for the 7 train to whisk them back to their island. I’m sure they’ll look more fondly out the car window when stuck in traffic on the Van Wyck Expressway on their next ride to JFK. That’s it for Manhattan bashing. For now. Today was possibly the coldest conditions I’ve ever run in. Leaving the house to drive south at 7:15am, my weather app was showing 12F (-11C), feeling like 2F (-18C). The bright sunshine was deceptive. It promised some warmth but gave none. Fortunately Urban Athletics came away with a truck load of team and individual awards, topped by first woman, enough to make it more than worth braving the cold. While some members were running in new, older, age groups, all of us felt like we were running in a new Ice Age. When I first said to coach ‘Troopy’ that I wanted to run this for the team he suggested I train through it and not allow it to interfere with my London Marathon preparations. That’s what I did when racing the 2016 Gridiron 4M last February while building for the Greater Manchester Marathon. I’m not big on ‘training through’. I like to think I can give every race a fair shot. So I was relieved that Troopy changed his mind. After hill repeats on Monday and 14 miles on Tuesday, he then adjusted my training to allow some tapering. I ended the week, Saturday, with 62 miles, almost 20 less than the previous week. And on Friday I saw DrStu who treated tightness where the glute meets the hamstring. After parking the car at Marcus Garvey Park, Sham and I ran the 3.5 miles to the start via St. Nicholas Avenue. It was a warm-up of sorts. We arrived with barely 10 minutes to go, just enough time to squeeze in a few strides and ‘relieve’ myself behind the locked toilet block. Huddling with UA team mates in the starting corral offered some collective warmth but some face muscles were not working making for slurred conversation. It was a relief to hear the gun. Only 16 minutes until I got reunited with my warm clothing. On the opening half mile climb I tucked into a group comprising team mates Javier Rodriguez, Carlo Agostinetto and Jamie Brisbois. Jason Lakritz was in a group several meters ahead of us. Several other masters runners were in close proximity including Peter Brady and John Henwood. Gradually Carlo and Javier edged away with John on their coat tails. I covered the first mile in 5:21. The course then descends for some 500 meters into Fort Tyron Park. I was now chasing John. Carlo and Javier had gotten away. As we circled the Cloisters and started to head home – this 5K is an out and back with the Cloisters marking the lowest point of the undulating course – for the first time I can remember I snatched a view of the Hudson River. The second mile is symmetrical – it descends for 500 meters, circles the Cloisters for 600 meters and then winds its way back up for 500 meters. I passed mile 2, the highest point of the course, in 10:43. At this point one is tempted to think one can cruise down to the finish. That’s a mistake. There’s still a steady 300 meter climb to tackle before the course drops down to the finish. At the crest of that climb I pulled alongside John only to have him accelerate away. In that final 800 meters of gently descending roadway I lost a few places and crossed the finish line in 16:36 per the official results, good for 33rd overall. It was a few seconds shy of my 16:30 target. My Garmin data is here but it’s mixed with my long warm-up. Javier won the masters in 16:09, John in 2nd in 16:31 and me 3rd, 1st M50 and top AG with 89.63%. UA won big. Harriott Kelly won the women’s race in 17:16 and Fiona Bayly, just shy of her 50th birthday, matched Javier by winning the women’s masters in 19:06. UA won the team races for masters men, masters women and veteran men (M50) and came 3rd overall for men and 5th overall for women. Harriott was gushing with joy, pride and relief. Typically understated and super modest for a short while she wanted, quite rightly, to remind everyone “I won” and get the plaudits. That feeling I could tell she had was that priceless feeling that comes when all the hard work and commitment pays big dividends and you come out on top. Well done Harriott! Other UA individual top 10 age group placers were as follows: Jason Lakritz 9th overall and 5th M25-29 in 15:46; Carlo Agostinetto 1st M35-39 in 16:10; James Brisbois 2nd M20-24 in 16:55; Matt Chaston 2nd M45-49 in 16:59; Aaron Mendelsohn 6th M40-44 in 17:06; Stefano Piana-Agostinetti 7th M45-49 in 17:47; Jonathan Schindel 3rd M50-54 in 17:54; Theo Dassin 2nd M15-19 in 17:57; Adam Kuklinski 4th M50-54 in 18:44; Ellen Basile 2nd W40-44 in 19:25; Paul Wong 10th M50-54 in 19:32; Jennifer Harvey 3rd W45-49 in 20:17; Dominique Saint-Louis 1st W50-54 in 20:27; and Isobel Porteous 4th W15-19 in 23:53. The NYRR race report, which runs a close second to this one, plus pictures are here and the full results, the format of which I’m still trying to master (! ), are here. I won’t calculate the average age of our placers. Suffice to say we are working hard to lower it! Meantime our mature runners are the best in the New York area and look amazing. In the penultimate race of 2015, and of my 40s, I fell just shy of my goal of 50 minutes. Spring had come to New York and many of us were able to make hay. The race also marked the end of the NYRR season-long club points championship and Warren Street managed to end on a high with 3rd in the open men’s race and 2nd in the men’s masters. That was enough in the final reckoning of the 2015 season overall, to finish 4th in the open men’s competition and 3rd in the men’s masters (assuming my math holds water). We’ll take that. While I may have had a lofty target of 50 minutes I had little idea how fit I was. In my two previous races – Bronx 10 and Grete’s Half Marathon in back to back weeks in early fall – I’d hit a real high with highest ever age grade (AG) performances (us masters runners rarely get in the mix at the sharp end so AG is a nice consolation). But in the 4 week period ending November 23rd I’d logged 120 hours of flying. And I’m not a pilot. The business travel took me to Seoul, Geneva, Singapore and Kuala Lumpur (twice!). While I enjoy traveling, and seeing new places like Seoul which was a pleasant surprise for running (see here for a sample run in Strava), my running routine that hangs around long runs and repetition workouts got bent out of shape. But somehow I got in 70 mile weeks. In a future article I’ll share how with the help of expert time management! Lining up in the front corral it was clear that West Side Runners (WSX) and New York Athletic Club (NYAC) would be duking this one out for the top team (see the NYRR race report here). Barely 400 meters into the race I found myself in the mid teens with 5 or so runners from each of these teams ahead of me. I passed the first mile in around 5:20, the second in 10:40, and then settled into 5:25-30 miles. For most of the race I found myself isolated. From 2 through 5 miles I traded strides and places with someone new to the local running scene who I was unfamiliar. Passing the 5 mile mark in 27:02, I got a gap on this guy and found myself running alone until John Davies of NYAC breezed passed in the 7th mile. John quickly opened up a gap on me. It was a timely kick up the backside as one often needs three quarters into a race when one is prone to losing concentration. In the closing stages I could see a sub-50, equivalent to my Bronx 10 performance albeit that was on a flatter course (this one took in the middle 4 mile loop and the bottom 5 mile loop, missing the northern hills but still taking in Cat Hill twice) was off the charts so I reconciled on running 50:30. Which I did with 5 seconds in hand. My 50:25 was good 10th overall, 1st place masters and top AG of 92.04 (once NYRR have corrected for 9th place Michele Giangaspro, a 47 year old 23 minute 5K runner who posted 3 PRs back to back). I got to hang out in the finishers area to see team mates finish – Carlo Agostinetto (2nd M35-39 and a PR in 51:25), Sebastien Baret (3rd M35-39 in 52:03), Danny Tateo (1st M50 in 55:37), Alex Lorton (final scorer in 5 man open team with 55:48), Antonio Nebres (2nd man in 3 man masters team with 56:59) and Fabio Casadio (57:21). Sebatian B. looking good at five miles. So with December 28 closing in fast I now have one race left as a M40-49 runner – next Saturday’s 2015 USATF New York 10 km Championships in Central Park, a place that is my second home. I will soon reach my goal of 50 – years rather than minutes. This race came as a timely shot in the arm. Perhaps I shouldn’t have been surprised. After all I’d put in a good few months training with many 70 mile training weeks and spent last weekend training in Boulder. But confidence was low on back of some mediocre performances at distances below my bandwidth, like the Fifth Avenue Mile. I’d also not raced at a distance of 10 miles or more since November 2013 so I was in uncharted waters. But an ‘easy’ opening mile in 5:18 put all my concerns to rest: the engine room had plenty of horsepower. I ended the day with my best ever age-graded (AG) performance. 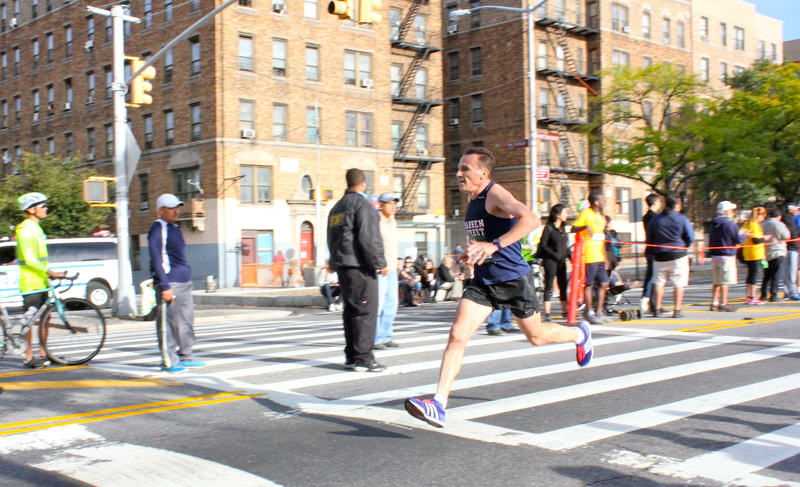 The Bronx 10-Mile is a classic race. Classic in distance – a rarely run imperial distance that harks back to Chariots of Fire days. 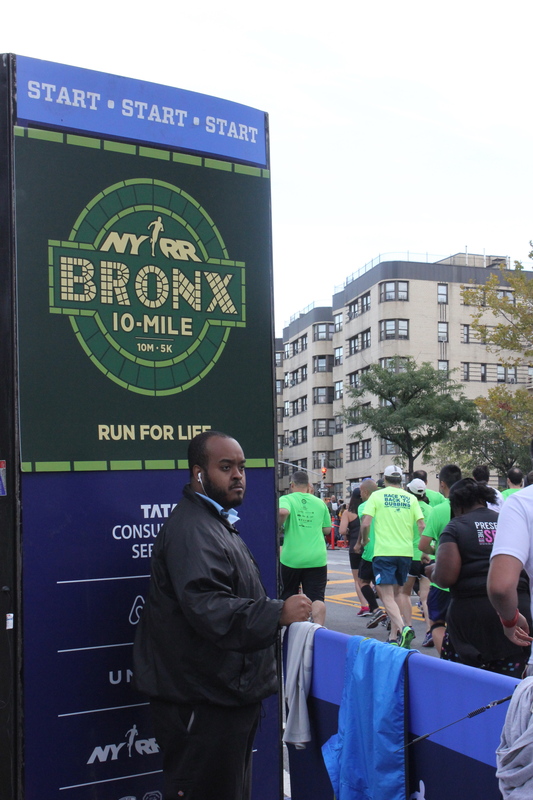 And classic in venue – much of the out and back course (Download Course Map (PDF)), gently undulating with a 600 meter steady incline just after the 10k mark, is on the Grand Concourse, the borough’s main artery. 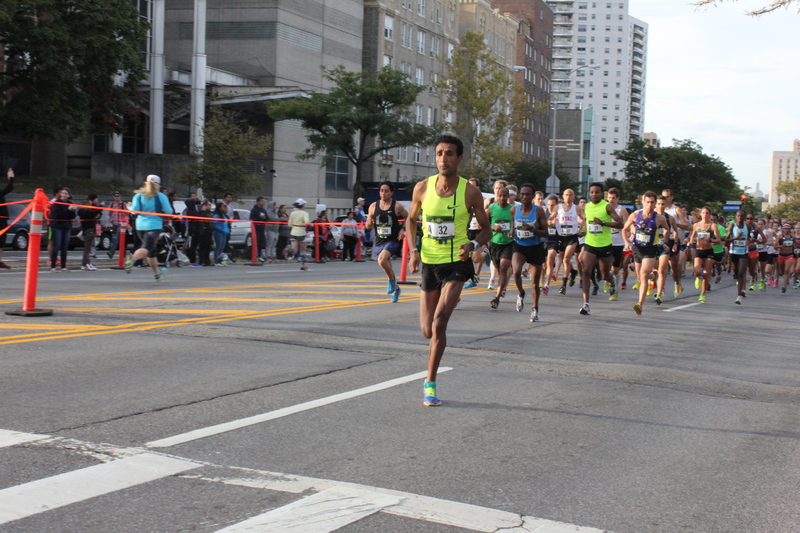 A record field of over 9,300 toed the line and, thanks in part to prize money and being a part of the NYRR Club Championship series, was loaded with talent. So it was no surprise that course records would tumble – Ayele Megersa Feisa setting a new mark for men in 48:18 and Salome Koskei for the women’s in 56:57. The course record looked vulnerable barely a mile into the race. As I passed the mile mark in 5:18 the leading two, sporting bright yellow tops, were over 100 meters ahead of me. In the early miles I settled into running 5:18-22 pace and by three miles I was running in a 5 main pack pack including Michael Cassidy, Brent Frissora and Bobby Asher. While running relaxed, strong and confident I was in the company of guys that, in recent years at least, typically beat me. That left me wondering whether I was out of my depth. Turns out I was not. During the approximately 2.5 mile section that’s not run on the Grand Concourse, I emerged as the driving force of the pack. I passed 5 miles in 26:57, an average of 5:24 mpm. By the time we got back onto the Grand Concourse at around 6.5 miles I was edging away from the pack. Unfortunately I had no one to chase: I could barely see the runner ahead. The route back was slightly net downhill and we had a tail wind filling our sails. The roadway on the other side was full of runners headed out, many cheering us on. As I reached 8 miles I realized I had stepped up the pace to 5:20 mpm. I seemed to be clear of my chasers. I was wrong. Soon after Michael Cassidy came cruising past and went on the open a big gap. With the finishing line in sight I dug deep and found that long lost sprint finish. 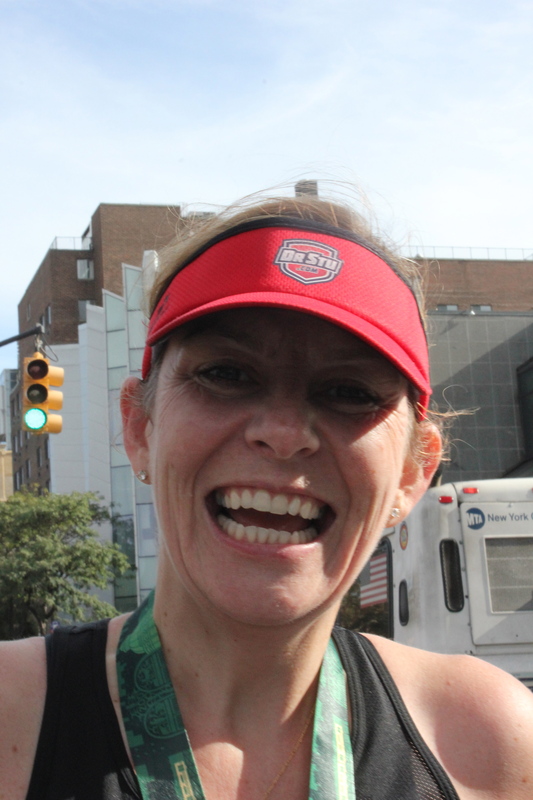 I crossed the line in 53:36, 40 seconds faster than my last Bronx 10 in 2012. The pictures capture the finale. This was my best race performance for sometime. I was first masters, 13th overall (lucky for some), first age grade on 93.26% and ranks me second on the UK rankings in 2015 for M45-49. But more importantly the Warren Street team boasted PRs for Sam Lynch (5th overall in 50:40), Carlo Agostinetto (54:57), Aaron Mendelsohn (56:17), Alex Lorton (58:10), Paul Sorace (64:17) and Michael Watling (67:14) and secured 3rd open team (Sam, Carlo, Aaron, Alex and I) and 1st masters (Aaron, Peter Heimgartner (60:07) and I). I was in the minority without a PR! How’s that? For my post race warm down I ran down the Grand Concourse with Aaron to Marcus Garvey Park where Sham had parked the car. There I waited for Sham and her running buddy Kelly Gould to run / walk their way back. As they came into view Kelly’s smile was as wide as Madison Avenue. And she had good reason, running 1:23:22, a 7 minute PR! Back home Sham – coach, manager, driver, camera woman – turned chef. She whisked up a brunch of egg and sausage on home-baked bread washed down with mimosas.